Mexican officials stepped up the bureaucratic process for U.S. boaters in 2014; has the process worked out? SOUTHERN CALIFORNIA — Bureaucracy is like taxes: it’s a process we all have to live with regardless of our level of annoyance or dislike. The addition, in 2014, of bureaucratic measures to manage boating traffic to Baja California from San Diego and points due north was certainly met with more than a little push back. Mexican officials have since made an effort to cooperate with U.S. boaters as much as possible, going so far as to host Temporary Import Permit (TIP) cancellation events across the United States. Has the permitting and paperwork process finally smoothed out? Are boaters navigating south of the border with ease, without worry of incomplete paperwork or otherwise lacking compliance? TIPs, for those who need a refresher, is a document boaters must legally possess in order to keep his or her vessel in Mexico. The permit allows the boat to remain in Mexico for up to 10 years. You’ll need a TIP even if you’re planning to navigate into Mexican water for one day or a few hours. The Log has covered the vessel entry/exit process in the past, but it is worth reminding boaters of the bureaucratic hurdles you’ll have to jump over as you navigate into Mexico – and the rules apply to anyone visiting Mexican waters, whether or not you’re actually setting foot on land south of the border. You’ll have to apply for your TIP online. The application process includes paying the current fee and providing relevant information, such as your passport number, anticipated crew list and vessel documentation. A spreadsheet is available to fill out the your list of passengers and crew members. The spreadsheet must be filled out and emailed to Mexican immigration officials (BC_ensenada@inami.gov.mx, for example). Immigration officials will send you a confirmation if your list is approved. You must bring this approval with you to your first Port of Entry. Your passport will also be a must once you’re out of the United States. Be sure to fill out your entry permit (FMM) and provide all passenger information when you’re checking in at the Port of Entry. All vessels entering into Mexico must have current and original vessel documentation on board. You must also complete a crew list, pay certain fees and surrender your FMM document once leaving Mexico. A few sources in the San Diego area told The Log there has been little to no drama for boaters navigating into Mexico from Southern California marinas and harbors. Some people are annoyed with the bureaucracy, according to these sources, but they also confirmed the Mexican government has made an effort to make the process as smooth as possible for U.S. boaters. Keeping in touch with Mexican officials, however, is paramount to ensuring an amicable process. The Mexican government published a handy guide for U.S. boaters, entitled “Visiting Mexico by Private Boat.” Many marinas in Mexico will happily share this guide with U.S. boaters. Marina de La Paz posted a PDF of the most recent guide and can be viewed here: www.marinadelapaz.com/pdf/BoatingInMexico.pdf. CONANP, or Comisión Nacional de Áreas Naturales Protegidas. The Association of Mexico Marinas, meanwhile, announced Mexican customs officials would be in Chicago, Dallas, Houston and Sacramento to cancel Vessel Temporary Import Permits. The Sacramento dates are Oct. 18 and 19, 8 a.m. to 5 p.m. Officials will be at 2096 Arena Boulevard in Sacramento on both days. Be sure to regularly stay in touch with Mexican officials to stay up to date with the latest in bureaucratic happenings. Below are a few contacts to help you through Mexico’s boating bureaucracy. 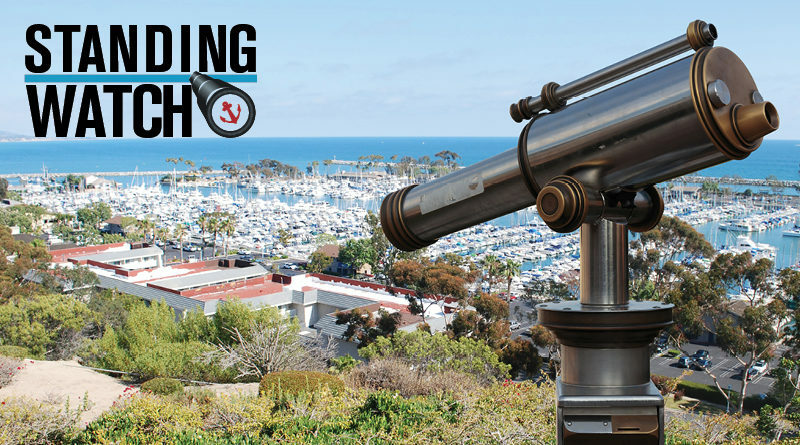 Most marinas will be able to guide you through the process. Remember to address your vessel’s TIP if you recently purchased a boat. TIPs from previous owners are non-transferable and must be canceled personally in Mexico. ← Cruising to Mexico: Should you heed the warnings? Great article for those wanting to venture south of the border. It would be worth mentioning the process required when you venture back home too. Having made the trip multiple times now, probably the most frustrating part of the bureaucracy is the lack of uniformity in the process and fees, depending on the person, place and organization you deal with in Mexico. Cash is king and have lots of it, preferably in pesos, because that is all they usually want to accept for payment. Have lots of small bills because they rarely have change, or so they claim. If your paying in dollars, expect an unfavorable exchange rate. Also, setting aside the allure of boating south of the border and all the romanticism associated with that, the reality of the situation is it comes with a lot more risk than many are willing to admit. For example, if your having your boat worked on in Mexico keep in mind capitalism operates much differently down there. The Port Captain works closely with vendors requiring a receipt of work performed has been paid in full, even if you don’t agree with the bill, before they will process you out of the country. In a nutshell, you have no recourse and are essentially held hostage until you pay up regardless of charges. And good luck contesting a bill or negotiating a refund in a dispute after the fact. Lastly, many of the things that we take for granted north of the border, are lacking down south. Simply put, what might be a much lesser issue at home can be catastrophic the further south you venture, especially in terms of health and personal safety. Boating in Mexico can be a great experience, but it’s not for everyone and for good reason!